The Willow Bend board is excited to welcome new board member Eric Souders. Eric was invited as a guest to the October board meeting, and while he initially only came to “check it out” he was unanimously voted on as a new member when he expressed an interest to join. Eric is an Accredited Wealth Management Advisor at Ascendant Financial Solutions with a focus on socially responsible and fossil fuel free investing. He has been active in the community during 20 years of living in Flagstaff as a Big through Big Brothers Big Sisters of Flagstaff, past board member of Flagstaff Friends of Traditional Music, Friends of Flagstaff’s Future, and Townsite Community Land Trust. 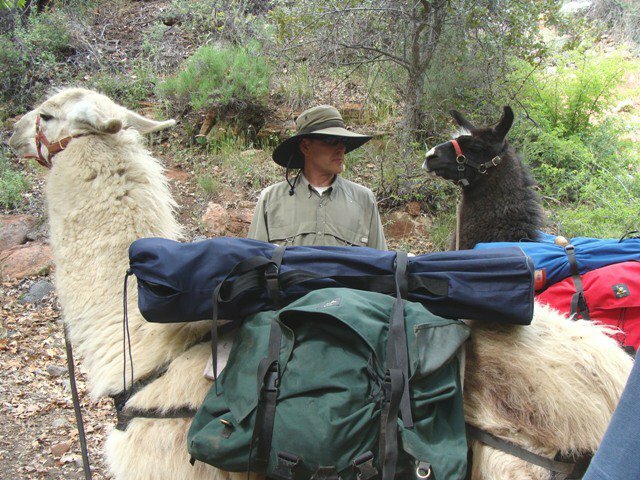 As a herder of llamas, he has been the Llama Superintendent at the Coconino County Fair Since 2000 and a 4H Llama Project leader since 2006. 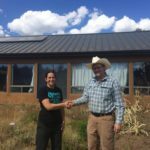 Eric brings financial and community organizing experience to Willow Bend, as well as a true passion for the environment. “I have had the pleasure of working with Eric when we served on other boards together, as well as organizing cleanup events, where his llamas helped carry out trash, Im so happy that he is joining the Willow Bend team” Said Moran Henn, WB Executive Director. Welcome to the team Eric (and the llamas). Read more about Eric on our board member page. Today was the conclusion of Willow Bend’s free guided tours of Picture Canyon Natural and Cultural Preserve for 2017. 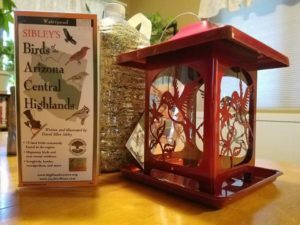 Willow Bend offers monthly tours of Picture Canyon from May through October, each with various themes like archaeology or birding. 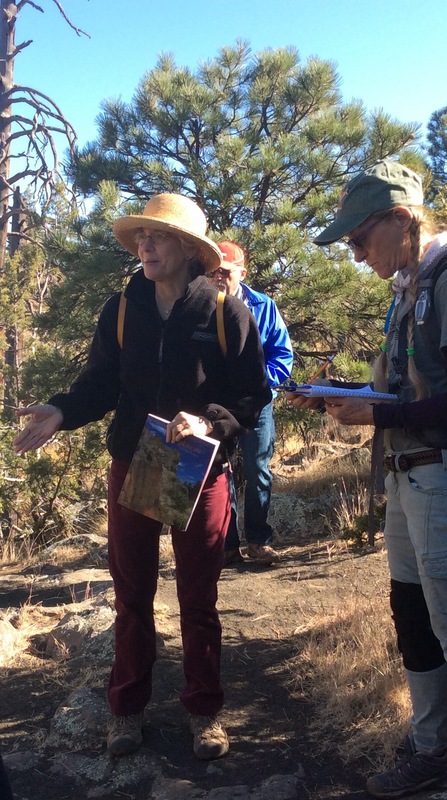 These tours are made possible by our partnership with the City of Flagstaff Open Space Program. In fact, exactly five years ago, the City of Flagstaff purchased Picture Canyon, helping to restore and preserve it so that all citizens can now enjoy the space for generations to come! In addition to leading these monthly community tours, Willow Bend takes all 3rd grade students on field trips to Picture Canyon! 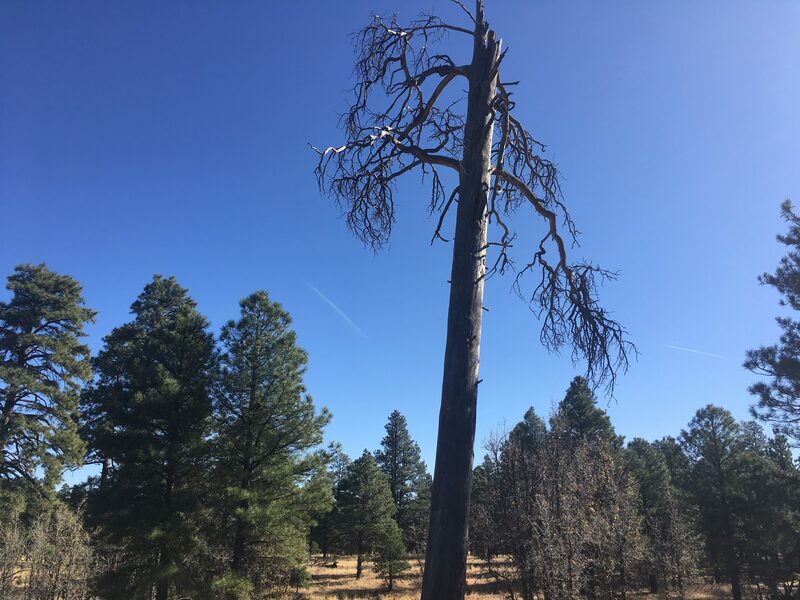 At Picture Canyon, students get the chance to experience one of Flagstaff’s most significant cultural and historic landmarks, view the city’s only waterfall, and learn about Northern Sinagua petroglyphs. 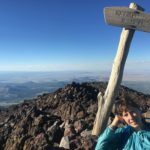 Hopefully, many of these students may very well be the environmental stewards of tomorrow, ensuring that future generations will also be able to experience and appreciate this remarkable and beautiful place. 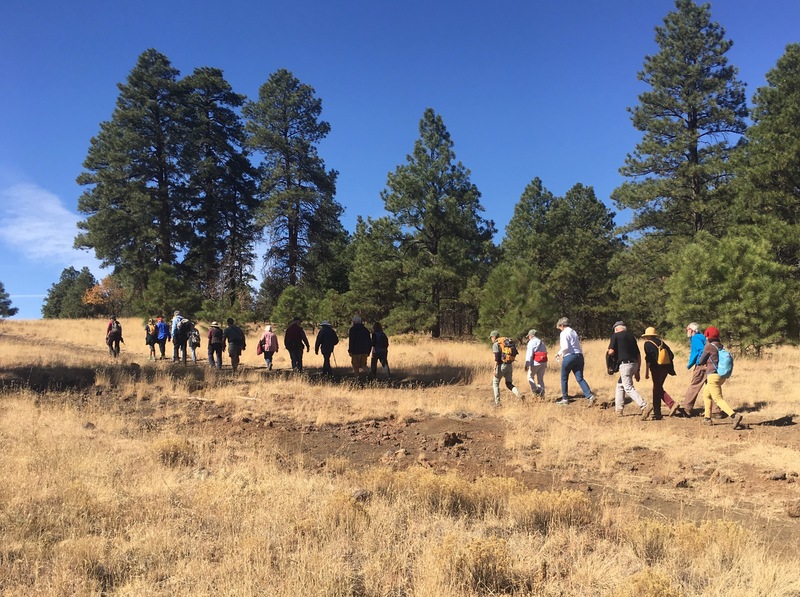 It was a brisk and sunny autumn morning, and tour participants met at the Picture Canyon trailhead; today’s tour covered community history including the restoration and protection of this area. 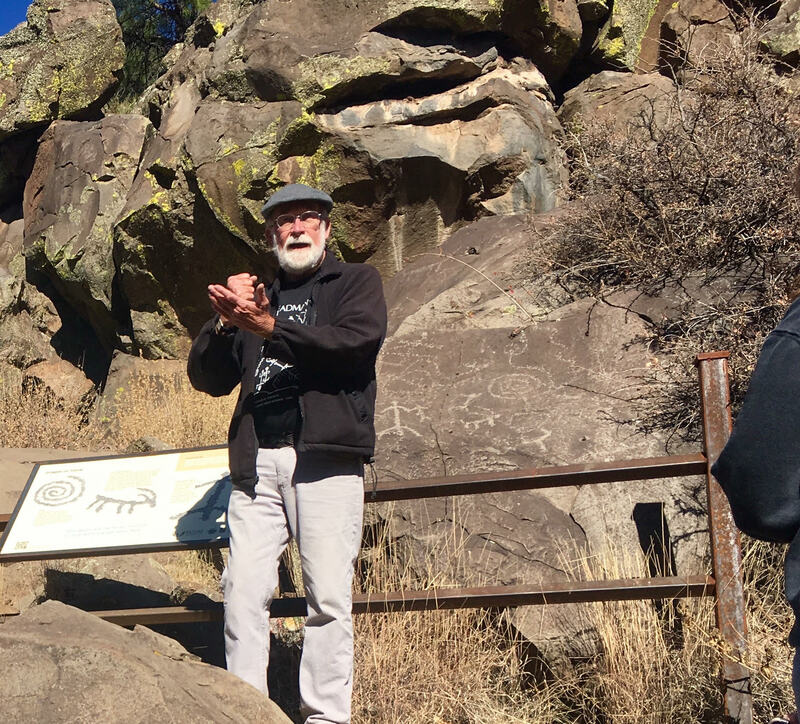 Tourgoers were fortunate enough to have archaeologist Peter Pilles in attendance, who gave an informative talk on rock-art, including the different ways in which these images are interpreted by different groups, as well as the techniques that were used to create petroglyphs. Pilles explained how archaeologists determine the rough age of the glyphs. After being etched out of the rock, petroglyphs’ color will begin to fade over time due to factors like sunlight, water and lichen. By comparing the color or patina of the glyphs to the rock and other glyphs around them, archaeologists can reason approximately when the petroglyphs were created. After all, “archaeologists will date any ol’ thing!” Pilles joked. Picture Canyon tourgoers were also lucky to have geologist Marie Jackson in attendance, who taught them about the sedimentary and volcanic rocks that crop out along the Rio de Flag. The ancient lava flow which flowed through what is now Picture Canyon before cooling into rock, Jackson explained, now sits atop of a small fault line which runs along the Rio de Flag through Picture Canyon. This fault line, not previously identified on geological maps of the area, is what leads today to the deep-sided walls of Picture Canyon’s volcanic rock; the same rock which ancient native peoples used to etch the petroglyphs after which Picture Canyon is named. For a handful on the tour, it was their first time visiting Picture Canyon, but many such as Members of the Picture Canyon Working Group were also present to share stories and pictures. Many return again and again to Picture Canyon not only to learn, but also to enjoy its beauty and peacefulness. Thanks go to all of the volunteer efforts which have taken place to help restore Picture Canyon to its present state today, to the community for making the preservation of Picture Canyon possible, and to all those who attended Willow Bend’s tours this year. More to come in 2018! 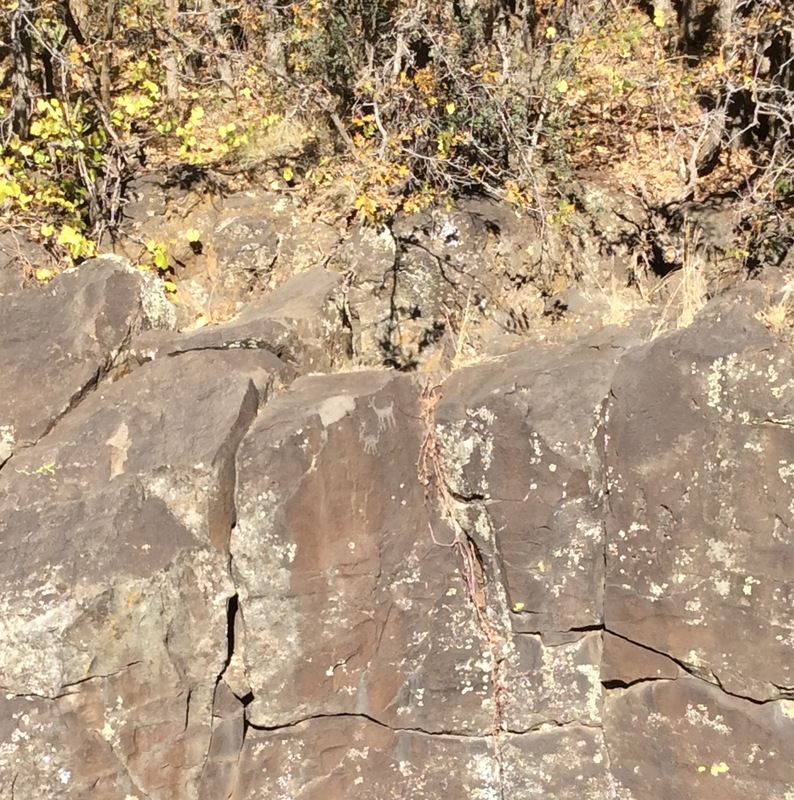 Can you spot the petroglyphs in this photograph (taken by the waterfall)? This tree on the trail is a woodpecker favorite. Willow Bend is excited to join the city’s Community Design and Redevelopment Department as they announce the completion and dedication of the Outdoor Classroom at Frances Short Pond. The classroom is located next to the Veit cabin and both will be used for environmental education. Willow Bend has been leading field trips for k-12 graders to the Pond for over 30 years. We were excited to initiate the outdoor classroom idea, and partner on it’s design and implementation. The classroom’s natural setting will help us deliver programs about the Rio de Flag riparian corridor as well as local flora and fauna. Included by the city’s Beautification and Public Art Commission as one of several planned amenities to be installed in the park, the classroom’s amphitheater style seating and podium are oriented to take advantage of views to the Peaks. The classroom is constructed from local malpais boulders and planted with native grasses to revegetate the areas disturbed by construction. Sustainability is promoted through the use of locally sourced building materials which contain only small amounts of embedded energy. The completion of the classroom continues the work begun almost 50 years ago by Jim David and others, to preserve the pond’s natural history and ensure its availability as open space. Over the years, students have used the pond as an outdoor laboratory, developing and learning from dozens of environmental education projects and experiments in and around the pond including creating an archaeological dig near the pond, planting cottonwoods, willows, and junipers near its banks, and creating the island habitat in the middle of the pond. 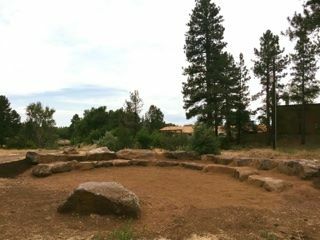 This BBB funded project was designed by the city’s Community Design and Redevelopment staff and built by volunteers from the Flagstaff Rotary Club, with assistance from the city’s Parks Department and Willow Bend. The outdoor classroom is free and open to the public on a first come first-served basis. 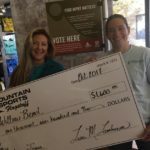 Mountain Sports Flagstaff for their support through their 1% for the Planet Program. This is the second year in which Mountain Sports sponsored our Downtown Geology Tours offering free tours to the community. With their support we were able to host 2 tours a month, between June-September. Back West Celebration of Stone Balancing for their generous donation. The event had over 300 participants and donated 100% of the event’s profits to Willow Bend and Flagstaff Arts Council. Thank you to these generous partnerships for supporting our programs, events, and ongoing work. 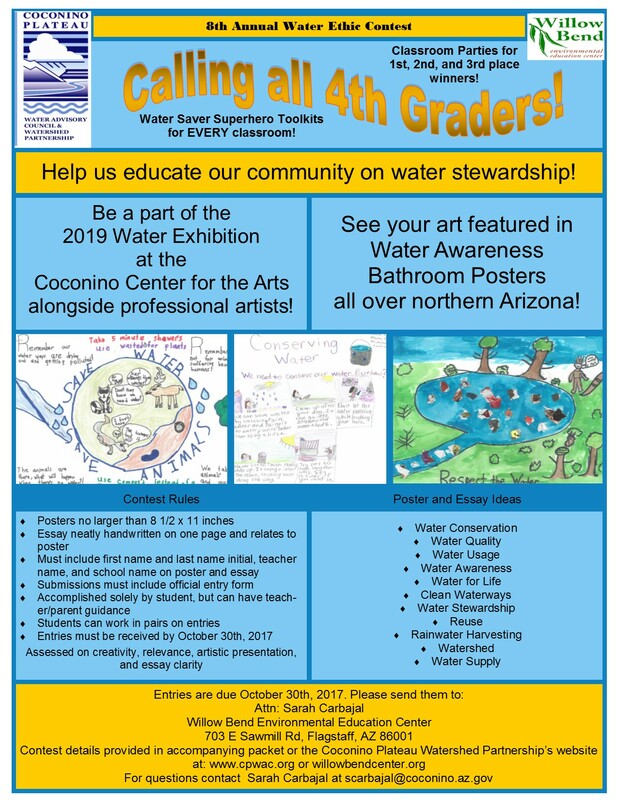 Willow Bend Environmental Education Center in collaboration with The Coconino Plateau Watershed Partnership (CPWP) invite 4th Grade classes throughout Northern Arizona to participate in our 8th annual Water Ethic Contest. In order to introduce children to the concept of the ethical use of water, we are inviting 4th grade classes throughout the plateau to participate in a contest in which they demonstrate the principle of responsible water use through artwork and essays. Entry Form: Please attach this Official Contest Entry Form. 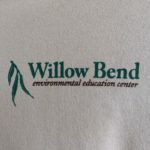 Where to send: please mail or drop off submissions to Willow Bend Environmental Education Center, 703 E. Sawmill Rd, Flagstaff AZ 86001. Deadline: October 30th, 2017 at 5pm. Awards: Classes to which the winning students belong will be treated to an in-class party, including a pizza party for the 1st place student, an ice-cream social for 2nd place, and a popcorn party for 3rd. The winning students will receive additional prizes and all participating classes will be rewarded with “water saver superhero tools.” All submissions may be used in promoting water stewardship throughout Northern Arizona. The teachers of the winning entries will receive a check for $300, $200, or $100. Art Work: The students’ artwork will also be utilized in posters as an opportunity to bring awareness to the variety of ways water is used, and provide examples of how conservation practices can save water. The posters are being distributed throughout Arizona in public restrooms, where a large amount of water is used. Places already signed up for the bathroom posters include: the Grand Canyon South Rim Visitor’s Center, City of Flagstaff, City of Williams, Hopi Water Resources, Northern Arizona University, US Fish and Wildlife, AZ Dept. of Water Resources, AZ Dept. of Environmental Quality, Coconino County, City of Sedona, Marshall Elementary School, and many more places throughout the community are in the process of getting the posters. This year’s submissions will also be featured at the Coconino Center For The Arts Fall 2019 special engagement all about water! 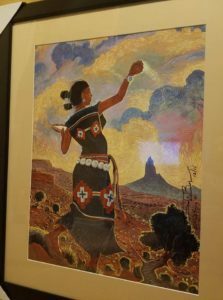 The exhibit will incorporate professional artists who have participated in programs geared towards education on water awareness hosted by the Coconino Plateau Water Advisory Council and other partners. This is an exciting opportunity for all participating students to have their art reach an even wider audience in an effort to educate visitors on water awareness. If you have questions about the contest, please contact Sarah Carbajal at (928) 779-1745 or scarbajal@coconino.az.gov. Our New Vehicle is a 2010 Prius! In case you missed the Annual Celebration, on Wednesday August 23rd 2017, and therefore missed the unveiling of our new vehicle, here is a special update just for you. Our new vehicle is a 2010 silver Prius. 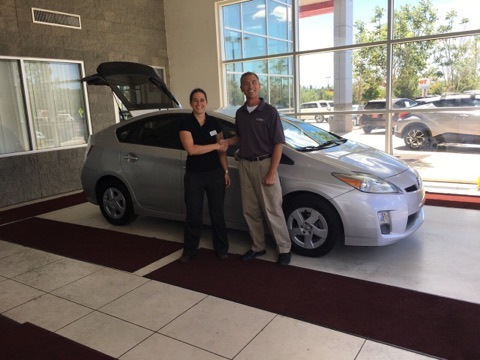 We purchased it through a partnership with Findlay Toyota. We are very excited about the vehicle, but NEED YOUR HELP to give it a WB look and feel. Participate in our Name the Vehicle Contest, or just make a donation and designate it to “paint the vehicle” (you can add that in the donation comment box). If you see us driving it around town on our way to or from a program/field trip/guided tour, be sure to wave and say hi. Willow Bend is excited to announce that after a rigorous search and long interview process (with many highly qualified applicants) we finally found and hired a new Education and Outreach Assistant! We would like to extend a warm Willow Bend welcome to Melissa Eckstrom! 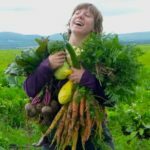 Melissa holds a B.A in Sustainable Agriculture from Sterling College in Craftsbury Common, VT. She has served in AmeriCorps National Civilian Community Corps in the American Midwest, as well as the United States Peace Corps in Jamaica. 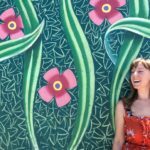 She is passionate about environmental education and has shared her love of the natural world while creating programming for schools and camps, managing gardens, and playing songs about worms on her ukulele. Melissa loves to ride her bicycle, bake bread, and draw silly comics in her sketchbook. We hope you will soon get to meet Melissa, at the Center, teaching a program, leading a field trip or running one of our community events. Make sure to introduce yourself and welcome her to the Willow Bend family. Name the Vehicle – Win Prizes! Now that our Bio Bug is gone, we have a new awesome Prius from Findlay Toyota (see previous post for vehicle updates). But, our new vehicle needs a name (and paint work to make it Willow Bend)! What: Help us raise funds by donating $2 per name suggestion. Make as many suggestions as you want. A committee made up of Willow Bend staff, board members, and students will review all the name suggestions and choose one lucky winner! When: Between August 23rd-September 23rd. Winner will be announced on September 30th, during the Annual Sustainable Building Tour (don’t need to be present to win). 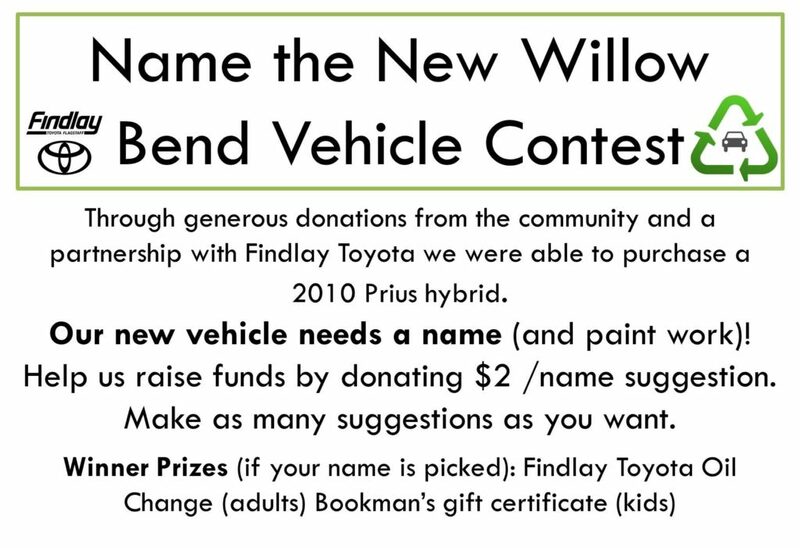 Winner Prize (if your name is picked): Findlay Toyota Oil Change (for adults) and a Bookman’s gift certificate (for kids). How to participate: You have lots of opportunities to participate: August 23rd during our annual celebration. Sep 1st at our table at the Coconino County Fair, September 2nd during our Science Saturday Colorado River Days, Sep 23rd at our table at the Festival of Science Science in the Park event or at our Center during the Stone Balancing event (same day). We are working on an online process, but in the meantime, you are always welcome to stop by our center if none of these events work for you. Remember, $2/name suggestion. The NEW limited edition Willow Bend T-shirts are in. Two colors to choose from (light blue and tan). Get them while they last. FREE with a new or renewed membership during our Annual Celebration on August 23rd, or $15 for the general public, or $10 for current members. Lots of different sized available. After the event they will be available at our center or duing programs and tabling events for $20. 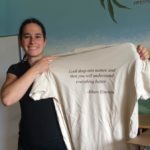 Design includes the Willow Bend logo on the front left side, and a quote on the back by Albert Einstein: “Look into nature and then you will understand everything better”. Not in town? You can order shirts by calling our office (928) 779-1745 or e mailing info@willowbendcenter.org. Add $5 delivery and processing fee. Thanks to Lucky Dog T-Shirts for working with us. We are super excited about our Annual Celebration on Wednesday, August 23rd at 5pm. In this post we would like to share with you some of the amazing auction items we will have, so you can come ready to bid! We will be updating this with new images, so check make sure you check back before Wednesday. Shonto Begay signed and framed art, massage gift certificates, Charley’s gift certificate, Sportsmen’s Warehouse gift certificate, beautiful glass wine glasses by local artist Christina Norlin, forged antelope-head metal coat hook by Denise Edwards, Grand Canyon Deer Farm passes, “Coffee Lovers” gift basket, Lumberyard gift basket and gift certificate, Patagonia backpack, dog paw protectors (snow boots), Jay’s Bird Barn bird feeder and feed, quilter pot holders, Airbnb stay in downtown Flagstaff, olive oil and MORE! 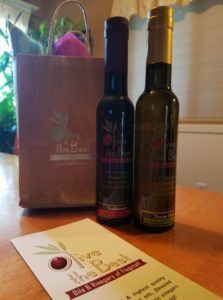 We will also have a raffle for a beautiful Flagstaff Community Market basket, as well as other items inducing books, coffee, olive oil and more!